Rylan Schueller at 160#. Schueller lost to Seah Weckman of NYA in a 4-2 decision, and he defeated Aaron Elseth of Sibley East in a 1:50 fall. Carter Mathies at 182#. Mathies defeated Miguel Mares in a fall at 3:31 in the Sibley East match at NYA. Photos courtesy of DeeAnn Brutger Schueller. 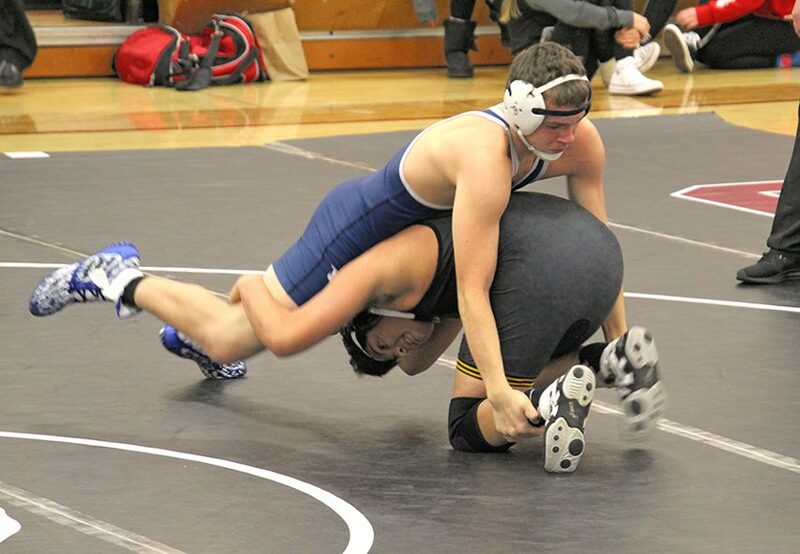 The Eagles mat-men flexed their muscles last Tuesday, Jan. 8, at the Norwood-Young America triangular meet. Eden Valley-Watkins defeated Norwood-Young America, 48-28; and swamped Sibley East by a final tally of 54-28. 106: Teagyn Ludwig (EVW) over Gabriel Michels (NYA) (Fall 1:41); 113: Reese Lentsch (NYA) over (EVW) (Forfeit); 120: Gavin Caron (EVW) over Tristan Wirtz (NYA) (Fall 3:31); 126: Wyatt Lemke (NYA) over Conner Lincoln (EVW) (Fall 2:09); 132: Sam Nistler (EVW) over Riley Lentsch (NYA) (Fall 1:14); 138: Joash Lord (NYA) over Taylor Ludwig (EVW) (Dec 8-6); 145: Trevyn Ludwig (EVW) over Blake Kimpling (NYA) (Fall 0:58); 152: Zach Nistler (EVW) over Jared Kleindl (NYA) (Fall 1:37); 160: Sean Weckman (NYA) over Rylan Schueller (EVW) (Dec 4-2); 170: Armando Walker (EVW) over Lucas Urness (NYA) (Fall 0:52); 182: Carter Mathies (EVW) over (NYA) (Forfeit); 195: Nicholas Christianson (NYA) over (EVW) (Forfeit); 220: Sam Meeker (NYA) over Ethan Kay (EVW) (MD 10-1); 285: Austin Schlangen (EVW) over Sean Franck (NYA) (Fall 4:41). 106: Draydon Morton (SE) over (EVW) (Forfeit); 113: Derek Steele (SE) over Teagyn Ludwig (EVW) (Fall 1:16); 120: Gavin Caron (EVW) over Wyatt Taylor (SE) (Fall 1:36); 126: Josh Sotelo (SE) over Conner Lincoln (EVW) (Fall 6:10); 132: Taylor Ludwig, Taylor (EVW) over Mario Hernandez (SE) (Fall 1:38); 138: Sam Nistler (EVW) over Bryce Klancke (SE) (Fall 0:20); 145: Lincoln Carpenter (SE) over Trevyn Ludwig (EVW) (Maj Dec 13-0); 152: Zach Nistler (EVW) over Jathan Mendoza (SE) (Fall 2:20); 160: Rylan Schueller (EVW) over Aaron Elseth (SE) (Fall 1:50); 170: Armando Walker (EVW) over (SE) (Forfeit); 182: Carter Mathies (EVW) over Miguel Mares (SE) (Fall 3:31); 195: Saul Hernandez (SE) over (EVW) (Forfeit); 220: Ethan Kay (EVW) over Ben Quast (SE) (Fall 3:11); 285: Austin Schlangen (EVW) over (SE) (Forfeit).